It converts food into useable nutrients, fuel and water. It eliminates the debris and toxins in food that could not be utilized. If the ability to digest and assimilate foods and eliminate toxic byproducts of food metabolism is impaired then optimum health is already lost. Many nutritionists state that the the condition of the gastrointestinal system is foundational to health because if one’s ability to extract energy and nutrients from food is impaired or the ability to remove from the body the toxic wastes that are coincident to extracting energy and nutrients from food is impaired — then one’s ability to function optimally cannot last long. Consuming ample probiotics which function like afterburners on a jet engine, giving us additional nutrients from our food, and which protect against microorganisms (#5 above). Chew, Masticate and Chew Again! Often overlooked... but the importance of chewing food well is an opportunity to live longer and better for those who will take the trouble to spend time chewing. A chief PROOF of this was a Jewish holocaust survivor who credited his survival to the simple choice to chew every bit of food to the point of liquefaction. This enabled him to extract every bit of energy and nutrients contained in the food. While others around him died from malnourishment he was able to maintain his energy and health and to live. The only difference was chewing the food to liquefaction. Same food... but different powers of extraction. Do you have the willpower to choose to chew? Gastric juices are added to the contents of the stomach when food is eaten. The purpose of gastric juices is to chemically break food down into smaller molecules. Depending on the type of food eaten, different types of gastric juices will be mixed with the stomach contents. Although some people like to take betaine hydrochloride supplements to help add “digestive acid” to break down proteins in the stomach, we prefer to the old fashioned way of consuming digestive bitters that will stimulate the body to produce its own digestive juices. It is possible to get digestive bitters in capsule form instead of having to eat the better leaves/plants themselves. Digestive bitters will increase the body’s own supply of gastric juices. Another of our suggestions is to not drink much liquid when eating for the obvious reason that liquid weakens the gastric juices chemical power. Again, do you have the discipline and faith to eat digestive bitters and to not drink during meals? Without enzymes, we would be stone-cold dead! One of the chief reasons to chew food well is to add salivary enzymes to the food. Enzymes are “bio-catalysts” — they cause chemical reactions to happen. We have some 3000 enzymes and over 7000 enzymatic reactions in our bodies. Without enzymes we would be stone cold dead! One of the chief differences between healthy people and unhealthy people is the amount of enzymes working in their body. Everyone has experienced the fact that even though a certain vitamin or mineral is supposed to do a particular thing, it does not work for everyone the same way all the time. Typically, the difference is that the person in whom the vitamins and minerals are working has the enzymes necessary to utilize those vitamins and minerals. In addition to enzymes being added to the food when food is chewed enzymes are also squirted into the stomach contents to help extract energy and nutrition possible. People do not have infinite powers of enzyme production. The more denatured food we eat the more enzymes are used up and the less remaining capacity we have to enzymatically extract nourishment from our food. That’s why when we are very young our body may squirt a teaspoonful of enzymes into the stomach contents and when we are older perhaps only a few drops. This is the result of the body realizing that it has to “ration” its enzyme reserves. Preserving enzyme capacity is a big reason for eating as many raw foods as possible. Fortunately, raw foods come with the enzymes necessary to digest them. So, when we eat raw foods we aren’t depleting our body’s stores of enzymes and we can count on good digestion (as long as we chew well). In addition to eating raw foods, we can further enhance our enzyme capacity with supplemental enzymes. Our favorite supplemental enzyme product is Cleansing Enzymes. 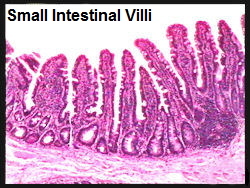 Most nutrients and food particles are assimilated into the blood stream via the small intestinal villi. Thousands of times magnification shows the tiny villi where intimate contact with the bloodstream and food occurs. Damage to these villi can be created by microorganisms (bacteria, fungi, and parasites, but especially fungus) that “eat” or damage the villi, taking away their ability to uptake nutrients. This means that the prevention that is worth a pound of cure is to keep the body relatively clean of microorganisms. Autoimmune disease can also damage the villi and so the prevention needed is to keep the immune system functioning well by maintaining high Vitamin D3 and glutathione levels and high mineral levels. They colonize the intestines much like grass can colonize a lawn. If they occupy all available space it is much more difficult for weeds, or (in the case of a human intestinal tract), harmful bacteria to grow. They product protective chemicals that circulate in the blood stream. These chemicals include B-Vitamins and anti-tumor chemicals.